It has been sometimes since my last article. As a way to apologize and to wish a very good new year, I would to share with you an amazing eBook offer. Packt Publishing is a British book publisher who has already published more than 2000 DRM-free ebooks and videos for IT professionals and for whom I had reviewed some Kinect ebooks. 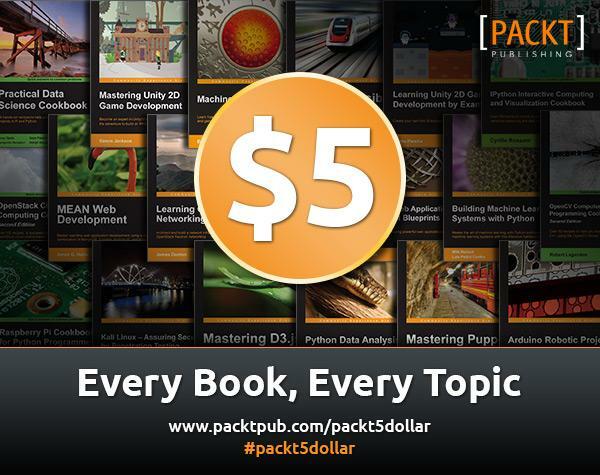 They currently have a short time offer any ebook for 5$, this offer will last until Tuesday January 6th. So don’t miss it. Packt Publishing catalog goes from mobile development, cloud services architecture, web app, Kinect interaction and even RaspberryPi or Arduino cookbooks. Cette entrée a été publiée dans Livres sur Kinect, News, et marquée avec ebook, offer, le 02/01/2015 par Vincent Guigui.